This article is about the microgame. For the similarly named enemy, see Ruff Puff. Info "Thwart the attacking aquatic creature by extending your spines. Precise timing is needed." Rough Puff is a microgame in the Reality folder in WarioWare, Inc.: Mega Microgame$!. There is a blowfish on the side of the screen. 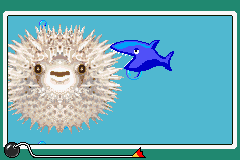 A second or two after the microgame starts, another fish will swim toward the blowfish from the opposite side of the screen. The player must press the button with good timing to inflate the blowfish and defend against the other fish. 1st level difficulty: The blowfish is on the side of the screen, giving the player plenty of time to react. 2nd level difficulty: The blowfish is on the center of the screen, giving less reaction time. 3rd level difficulty: The blowfish is on the center of the screen and the other fish swims towards the blowfish in one of two different ways. The other fish will either swim towards the blowfish like in level 2 or swim in, stop and swim back, and then swim toward the blowfish. French Ca pique ! It Stings !